As you are aware I recently moved in to a new home and required some electrical repairs and adjustments. I was very impressed with the work carried out and how your team conducted themselves. I’ve even had other tradesmen ask who installed the fuse box because it looked so professional. I wish I had taken your advice, before purchasing the property and had the electrical survey done. From your initial visit it quickly became apparent more work needed to be carried out to bring the property up to the current electrical regulations and standards. Thankfully this has now happened and I can sleep easier at night knowing I’m not going to get blown to bits when I turn the light on. I’d have no hesitation in recommending you as I know you will carry out a first rate job to a very high standard." "We were given Steve at J M Kay Electricals details by our builder and he was also recommended by our neighbour to completely rewire our new extension and provide lighting and a sound system. Steve and his team did a great job, working to accommodate the intricacies of our build project and nothing was too much trouble. One of his team went above and beyond to put right a couple of mistakes made by other trades and was happy to fit and wire an extractor system that should have been done by another fitter. 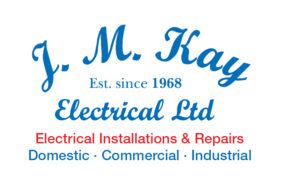 We are very happy with the work and would highly recommend J M Kay Electrical!" "We have worked with Steve and his team now for more than 20 years , always delivers great service and quality work." "We have used the services of JM Kay Electrical Ltd several times over the past few years, most recently to replace some old lighting in our office and what a change it has been! The new LED lighting is not only much brighter and creates a warm glow but we can also see our colleagues in a much clearer light, although how much of a good thing that is remains to be seen! Steve Kay always provides a very prompt service, often coming to our aid at short notice in an emergency, and his pricing is very competitive. The team around him are always pleasant to deal with and work hard to get the job done in good time. We would not consider going anywhere else for our lighting/electrical needs. Thanks to Steve and the rest of his team." "Have used Steve and his company for many years, first a complete new build and then subsequently alarm and various electrical additions and maintaining the electrical systems, all first rate work and friendly bunch to deal with." "I can highly recommend Steve and the team at JMK Electrical Ltd. They go over and above what you would normally expect from a electrical contractor, doing everything in house, for domestic, commercial and industrial clients. They take time to fully understand a clients requirements offering great personal service and I cannot recommend them highly enough."